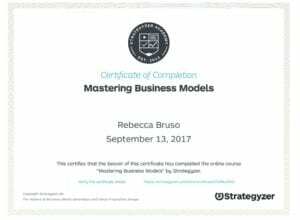 September 13, 2107 – Becky Bruso has completed the Strategyzer Mastering Business Models Course. This course is an online course that will teach you how to map, design, assess, and test Business Models. This training uses a framework presented in the popular books The Business Model Canvas and Value Proposition Design. It is used by over 5 million+ business practitioners.